Known as the City of Good Fortune, Oyama city is located in Tochigi Prefecture, about an hour and a half North of Tokyo. One of Oyama’s claims to fame are their delicious Oyama Udon. These udon noodles are made from special wheat flour and you can enjoy them in a simple broth or even a curry soup! Oyama is also the home of many paper artisans who specialize in dolls made out of paper. These intricate dolls are made by twisting traditional Japanese paper to create amazing patterns. Oyama also produces internationally renowned silk used in making kimonos. You can arrange kimono rentals here and take a walk around the city. 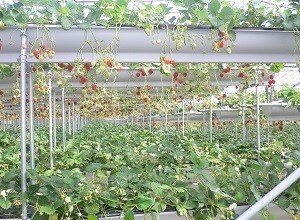 The prefecture of Tochigi is famous for strawberries, and if you venture a little outside of town, there are strawberry farms that will let you pick your own basket of some of the best strawberries in the world! I had some friends here from a previous trip and some of my friends from college are here. As far as making friends in Oyama, going out and being social helps. I met one of my best friends while Christmas shopping and another friend at an International fair. There is also a university nearby so I hang out with some of the students there as well. I usually find out about fun events through my friends or by asking my students. Most of the staff here at Oyama School are not from Oyama so I try to inform them of upcoming activities. Also, Oyama’s home page is helpful. There are numerous translating sites that can help you if you don’t understand Japanese. Google Translate can covert entire websites. During Initial Training one of the trainers told me about a large semi-annual convention called Comiket. I enjoy reading manga so I made sure it was on my calendar. During winter break, one of my students, an old college friend and I spent time at the world famous Tokyo Big Sight amazed at the thousands of cosplayers and comic vendors. By the end of the convention, our bags and memory cards were full. We all are looking forward to the new Comiket convention in August.